Tina and Nick chose Red Cliff Ranch for to celebrate their wedding. They were one of the sweetest couples and most relaxed couples I've worked with. The ranch fit their personalities perfectly. This black and white image is of one of my favorite moments from Tina and Nick's wedding day at the ranch. Their ceremony took place in the large meadow that faces the towering red rocks in the distance. 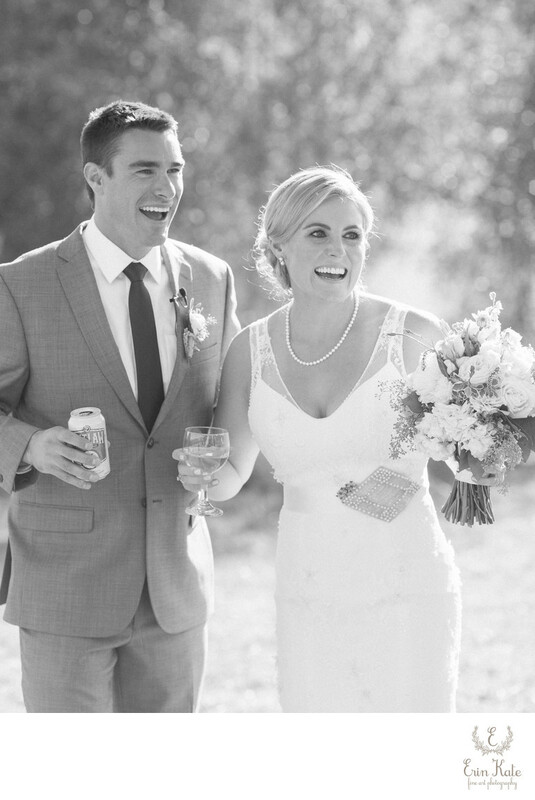 The Just Married couple walked out of their ceremony and at the end of the aisle they were given a beer and a glass of wine to toast each other. They were so full of joy and turned around to see all their guests cheering for them and celebrating their love! I love how candid and real this moment is. I love how it shows the pure joy that they were feeling at that second. I always try to capture real, natural reactions on a wedding day. Those are the photographs of people that cannot be staged or planned. I am constantly anticipating these times as I photograph a wedding story. My favorite response from couples when they view their images for the first time is to hear them say, "I cannot believe you go that shot! I didn't even know you were there." That's when I know I'm doing my best as their photographer. Location: 9485 E Lake Creek Rd, Heber City, UT 84032.